A Topographical Map of the North Part of New-York Island, exhibiting the Plan of Fort Washington, now Fort Knyphausen, With the Rebels Lines to the Southward, which were forced by the Troops under the Command of the Rt. Honble. Earl Percy on the 16th Novr. 1776, and Survey'd immediately after by order of his Lordship. By Claude Joseph Sauthier. This is an uncommon of the northern part of New York City issued 1860 for Valentine's Manual of the Corporation of New York. 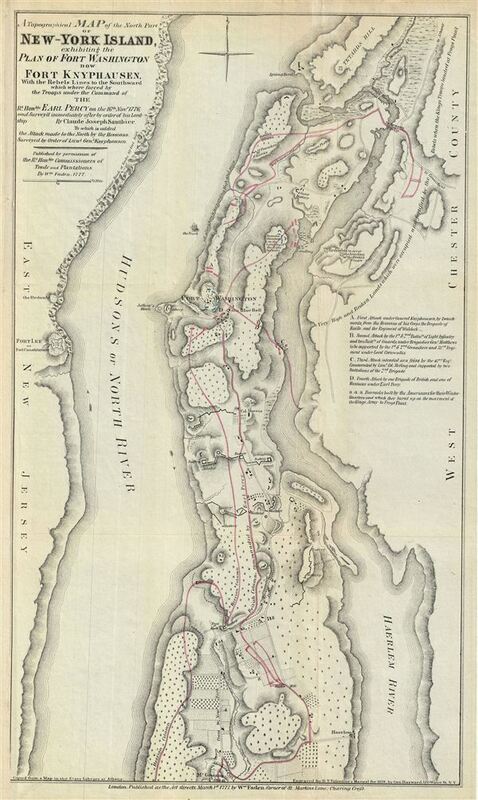 Originally prepared in 1777 by William Faden to illustrate the struggle for control of New York City during the American Revolutionary Wary, this map covers upper Manhattan, including the area now known as Washington Heights. Fort Washington is featured in the center along with Fort Lee or Fort Constitution across the Hudson River in New Jersey. This important revolutionary era map depicts the Battle of Fort Washington in 1776, when the British and Hessian soldiers, under the command of General Howe and Wilhelm von Knyphausen, attacked New York City which was defended by the 'rebels' under George Washington. After capturing Long Island in 1776, the British moved northward and defeated the American Army in White Plain in October 1777. In November 1777, General Howe attacked the troops left behind at Fort Washington and forced them to surrender. Almost three thousand men were taken prisoners as a result of what is believed to be one of the biggest errors of war on the part of General Washington. The map features a lettered key near the right margin annotating the various stages of the battle. This map, copied from a map in the State Library of Albany, identifies Claude Joseph Sauthier as the original cartographer. This map was engraved by George Hayward for the 1860 edition of D. T. Valentine's Manual.